When you try to connect to a machine using Remote Desktop connection, you might come across this error message. This is because Windows Server only allows two connections through RDP, and you’ve either have two users already logged on to that machine, or you’ve got disconnected sessions that still thinks they are active. 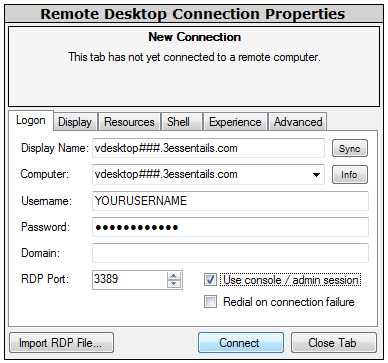 If a user simply closes the remote desktop window when they’re finished, that user will still remain logged on. To gain access to the server you will need to log on using the console session ( session 0 ). The following lists options for how to log on using the console session from a Windows or a Mac OS. This will allow you to log in and close the remote sessions. In all options replace vdesktop### with your server IP or hostname. If you do not know it please contact support. Option 1: Use RD Tabs to log on using the console session. 3. Check the Use console / admin session. 5. Once logged in you can now start Task Manager (taskmgr) and log off the users in the Users Tab. 6. Log off properly by going to Start > Log Off and re-login with your account. Option 2: Use the mtsc command to connect to the console session. 2. Execute the command in a command prompt or Start > Run > Type the command to start mstsc > Enter. 4. Once logged in you can now start Task Manager (taskmgr) and log off the users in the Users Tab. 5. Log off properly by going to Start > Log Off and re-login with your account. Option 1: Use Microsoft RDP client for Mac version 2.1 or greater. 2. In the Computer box, type the name or IP address of the Windows-based computer that you want to connect to, followed by /console. There is no space between the IP address and /console. (for example, vdesktop###.3essentials.com/console). Note: This login method works only when you connect if your server is running 2003 OS.